The Fitzroy Georgian style solid cast brass 3 light chandelier, crafted entirely by hand from solid brass and hand finished in a mellow natural brass. A stunning high quality chandelier, with a detailed ribbed ceiling mount and brass chain suspension. Highly detailed ribbed central rod and three double curved arms fitted with brass candle pans and ivory candle tubes. Height adjustable at the time of installation by removing chain links, minimum height 60 cm, maximum drop 150 cm. A class 2 double insulated chandelier, no earth required. This chandelier has been lacquered to ensure that the finish lasts without polishing. It is important not to use any abrasive or chemical cleaners as this will damage the finish. A light dusting or cleaning with a damp cloth is all that is required to maintain its good looks. 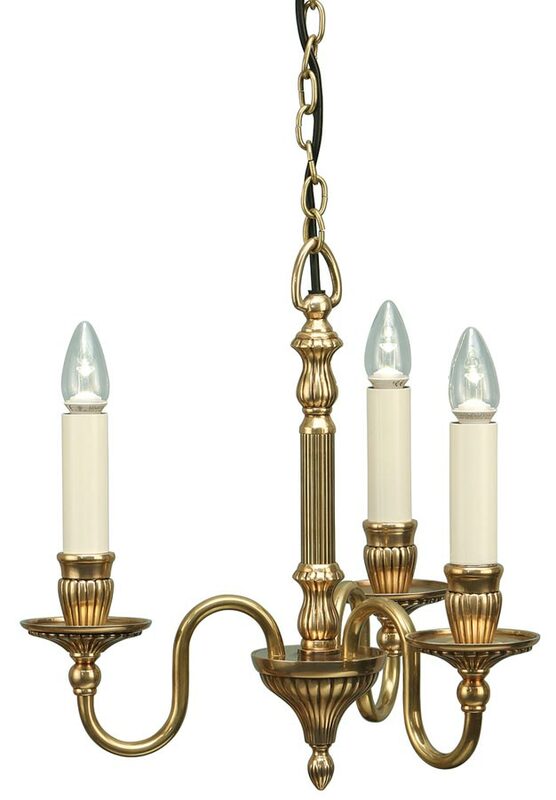 The Fitzroy Georgian style solid cast brass 3 light chandelier, part of the Rochamp collection of solid cast brass light fittings. Made entirely by hand using traditional sand casting techniques passed down through generations. The parts are then polished before being patinated to give an aged look.